Time played an important faction this, as dogs are thought to have been domesticated as early as 130000 years ago. Early man decided that man- eating wolves didnt make best pets. They eventually bred the aggression out of them by accident, and made a new species, family dogs. Recent molecular evidence shows that dogs are descended from the gray wolf, domesticated about 130,000 years ago. But if they all share a common ancestor, why do toy poodles and Great Danes seem to have little in common? Years of selective breeding by humans has resulted in the artificial "evolution" of dogs into many different types. From Pekingese to St. Bernard and greyhound, dogs come in such startling variety it's easy to forget they belong to the same species. The profusion of breeds today -- at least 150 -- reflects intense, purposeful interbreeding of dogs in the past 150 years. One consequence of interbreeding to create purebreds with sharply individual traits is that many disease-causing genes have become concentrated in these breeds. Because of the growing concern about health problems and the availability of powerful methods to hunt genes, scientists are hard at work on the "dog genome project." As with the Human Genome Project, the goal is to locate and map canine genes, particularly those that play a role in disease. Genes that influence behavior are also of great interest. At the same time, the entire history of dogs and their relationship with humans has undergone some rethinking recently, thanks in large part to high-tech molecular dating methods that can determine evolutionary relationships and chronologies. The dog, Canis familiaris, is a direct descendent of the gray wolf, Canis lupus: In other words, dogs as we know them are domesticated wolves. Not only their behavior changed; domestic dogs are different in form from wolves, mainly smaller and with shorter muzzles and smaller teeth. Darwin was wrong about dogs. He thought their remarkable diversity must reflect interbreeding with several types of wild dogs. But the DNA findings say differently. 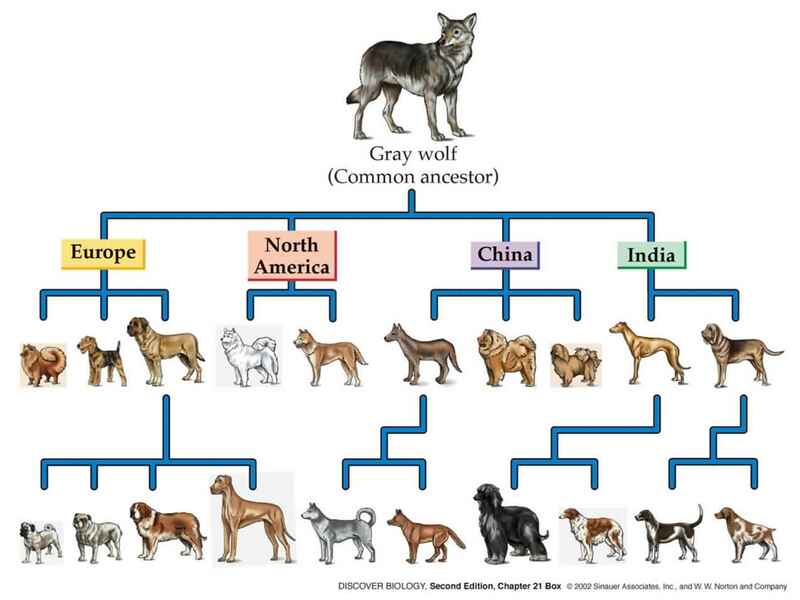 All modern dogs are descendants of wolves, though this domestication may have happened twice, producing groups of dogs descended from two unique common ancestors. How and when this domestication happened has been a matter of speculation. It was thought until very recently that dogs were wild until about 12,000 years ago. But DNA analysis published in 1997 suggests a date of about 130,000 years ago for the transformation of wolves to dogs. This means that wolves began to adapt to human society long before humans settled down and began practicing agriculture. This earlier timing casts doubt on the long-held myth that humans domesticated dogs to serve as guards or companions to assist them. Rather, say some experts, dogs may have exploited a niche they discovered in early human society and got humans to take them in out of the cold.